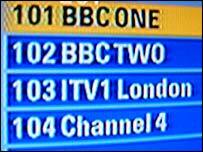 The UK's switch to digital television could begin as soon as 2007, according the media watchdog Ofcom. The regulator said it would be possible to phase in digital-only areas within three years. Broadcasters should be able to switch off analogue signals completely by the 2012 deadline. Currently, about half the households in the UK have digital television through either cable, satellite, or the free-to-air service Freeview. Ofcom said ITV, Channel 4 and Five would have to comply with 31 December 2012 as a "backstop date" to turn off their analogue signals. The watchdog issued proposals on Tuesday stating the channels should be obliged to provide digital coverage "that is at least substantially the same" as existing analogue coverage. The government wants to switch the country to digital television to free up broadcast frequencies and to encourage technology that allows for more channels and a clearer signal. Ultimately, the change could affect between 80 and 90 million television sets. The government originally hoped the analogue signal would be switched off by 2010. But in July, culture secretary Tessa Jowell said the expected changeover had been put back by two years. Two villages in south Wales, Ferryside and Llansteffan, will take part in a trial which should see their analogue TV signals turned off next year. Elsewhere in Europe, Berlin saw its analogue signals switched off last year. The German capital is now only served by digital TV.